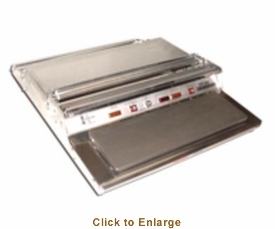 You�re viewing our Omcan wrapping machine single roll with 5" x 15" hot plate and non-stick Teflon cover. The wrapping machine is made of durable aluminum and stainless steel construction, and the wrapping surface is built of all stainless steel for fast and easy clean up. Individual wrappers are equipped with extra large rubberized feet to prevent sliding on counter surfaces. The wrapping machines feature solid state controlled hot rod cut off bars, as well as a standard size hot plate with a non-stick Teflon cover. Our wrapping machine comes with a manufacturer warranty. We can answer any questions you may have about our products. Scroll down to view our Omcan wrapping machine single roll with 5" x 15" hot plate and non-stick Teflon cover. 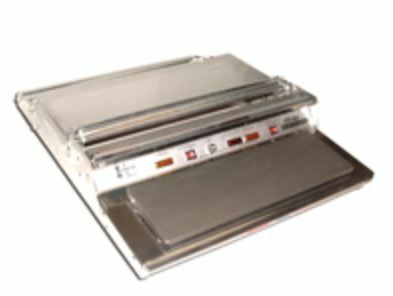 Hot plate is 5" x 15" Solid state controlled hot rod cut off bar Standard size hot plate with a non-stick Teflon cover. Dimensions (DWH): 23" x 19.5" x 4.5"
Packaging Dimensions: 36" x 21" x 7"